This isn’t the first time I’ve been asked this question, though people phrase it in different ways. Students have asked me, for example, if it is OK to pray about someone you admire. Let me start my response this way: I definitely encourage singles to pray about relationship decisions. God is eager to guide us and give us wisdom about every choice we make—especially something as significant as who we will spend the rest of our lives with. A young man asked if he could pray and ask God for a specific girl during the Q/A portion of one of my seminars. In other words, prayer is not intended to be a substitute for old-fashioned pursuit and courtship. If you like her, tell her and pursue her. One way or another, the answer is going to come from her, not directly from God. If she’s not interested then it’s time to move on. I never encourage women to make the first move as far as initiating courtship or expressing romantic interest. With that in mind, here’s my main piece of advice: don’t assume a guy is interested in you unless he has made it 100% clear. 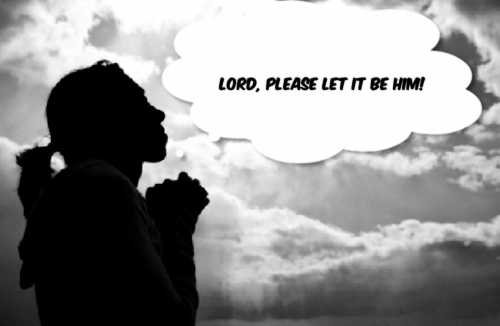 I’ve noticed a tendency among less mature Christian women: “praying for someone” can turn into a complete fantasy world. She’s planning the wedding and praying about what to name their first baby while the “potential husband” hasn’t even asked her out for coffee. Part of “guarding your heart” (Proverbs 4:23) means not allowing your fantasies to consume your thoughts. *Remember that “NO” is an answer, even if it isn’t the one we want to hear. *Don’t expect God to supernaturally coerce someone into loving you. It doesn’t work that way. *I really wish I didn’t have to say this, but I do: don’t tell someone you barely know that God told you to marry him/her. Your unsuspecting future spouse may not have gotten the divine memo. *Last but not least, remember that God is not going to choose your spouse for you (see God’s Will and “The One.”). He will help you choose wisely, but don’t expect Him to choose for you.